The soft layers of this cotton-blend tortilla swaddle and cap keep baby cuddled and irresistibly cute. From their sweet rosy cheeks to their delectable little toes, you know your baby looks good enough to eat, and now he or she can dress the part with this fiesta-worthy rendition of swaddling clothes. Soft layers of stretchy cotton-polyester blend "tortilla" envelop your cutie keeping them cuddled, secure, and looking deliciously adorable. Since too much heat can cause baby (and his or her parents) to lose their cool, the breathable fabric blend ensures that the little one will stay at a comfortable mild temperature even through summer's most scorching days. A matching hat provides the perfect topping. When it comes to standout baby gifts, this set is the whole enchilada. Cut and sewn by hand in Brooklyn, New York. As a self-proclaimed "foodie," Katharine Harlan Owens credits Julia Child for inspiring her to be a strong woman both in the office and in the kitchen. Before going into the baby business, she worked in wine marketing in Napa, California. She loved the industry because it allowed her to combine her passion for wine and food with her entrepreneurial spirit and love of marketing. In early 2012, she embarked on a new career path and developed a cheeky children's apparel line devoted to inspiring every parent to savor the greatness of life. As Julia would say: bon appétit! Wash before first use. Machine wash cold, gentle cycle with like colors. Tumble dry, low heat. 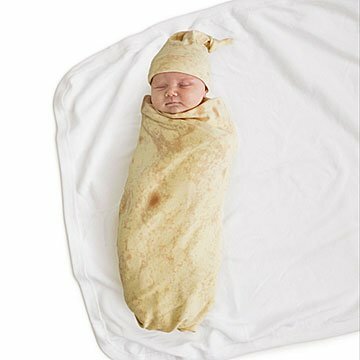 The Tortilla Baby was a great gift for friends (he's an Executive Chef) celebrating the birth of their newborn son. The gift was humorous, fun, unforgettable, and actually practical for the new little "baby burrito", Ben. It was well-made, great graphics and quality materials. I bought it with the taco booties too...so cute and fun! Great gift â€”burrito wrap swaddle with matching hat and taco booties. How cute can you get?! Waiting for my grandson to be born. I bought this as a baby shower gift for friends having their first and they loved it! It is a little confusing to figure out what it is when just looking at the package, but once they opened it up and pulled out the blanket and beanie.. they figured it out. Can't wait to see their little burrito all wrapped up! The helpful note about how to wrap up the little one was a lovely addition for new parents. Cutest thing for the cutest baby! Most talked about Christmas gift! The perfect gift for a mexican food obsessed, mother to be! Perfect gift for the memory book!! Just ciuldn't Be a cuter baby outfit! Material feels a little thin. It's printed poly. But super cute and fun.